Mel Brooks is renowned for spoof films, how does Spaceballs compare? With the air on Planet Spaceballs running out, President Skroob and Dark Helmet having devised a plan to steal the air from Druidia: he must kidnap Princess Vespa and blackmail her father. The only people standing in their way are Lone Starr and his trusted sidekick Barf, but to do this they must learn the way of the Schwartz. Spaceballs is a quintessential Mel Brooks film with the storyline based on Star Wars. What differs with Spaceballs is that it is a spoof of just one film rather than an entire genre – this should make the film feel more uniform however it is the opposite. 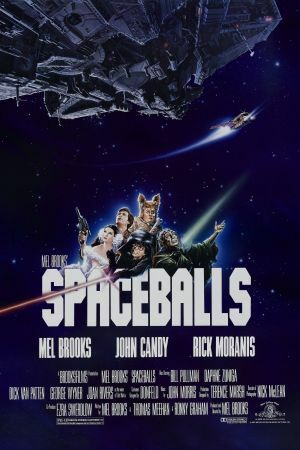 Where Brooks’ other films feel like a storyline was created and then humorous scenes built into it, Spaceballs feels like an extended sketch show which means that the film isn’t as good as unfortunately the tangents aren’t humorous. The problem with lead characters Pullman’s Lone Starr and Zuniga’s Princess Vespa is that they are extremely dull, which makes them very difficult to engage with and feel like they are only there to move the film along. On the opposite end of the spectrum from the boring ‘goodies’ we have Rick Moranis as Dark Helmet who is really the star. He plays the role with entire seriousness, likening him to Darth Vader but with small man syndrome. The real problem however is that Spaceballs goes from sketch to sketch, which are very hit and miss. The best part of the film is the thirty seconds in which John Hurt re-enacts his scene from Alien but with different consequences whereas the scene showing Dom DeLuise as Pizza the Hut is a good idea however it only works as a passing reference not the three minute scene it has been given. If easily available give Spaceballs a try, but if not then we wouldn’t recommend going out of your way for it. For better Mel Brooks’ movies consider watching either Young Frankenstein or Robin Hood: Men in Tights.